Kate and Jason's Wedding - Traveling to D.C. 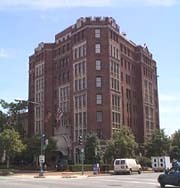 The Henley Park Hotel is located in downtown Washington, DC at 926 Massachusetts Avenue, NWclose to the Mall and easily accessed by car, plane, or train. We have arranged a really great room rate for our guests at this historic hotel of $99/night for a standard room and $135/night for a junior suite. To make a reservation call 1-800-222-8474 and tell the operator that you are a member of the Finnefrock/Taylor wedding party. Take 95 S to the Baltimore-Washington Parkway (295 S) toward Washington. Take exit US 50/New York Avenue. Stay on US 50 for 4 miles and make a slight right onto L Street. Turn right onto Massachusetts Avenue. The Henley Park Hotel will be on your left. The closest airport is National Airporta 15-20 minute cab ride from the hotel. If you fly into Baltimore-Washington International or Dulles International, the ride will be longer: 30-45 minutes from BWI and 45-60 minutes from Dulles. Union Station is a 5-10 minute cab ride from the hotel. If you plan on taking the train, we recommend making a reservation on a metroliner train. You can do this online or by calling 1-800-USA-RAIL. NOTE: If you choose to come via plane or train, you will NOT need to rent a car. There is a metro stop just a few blocks from the hotel and almost everything in DC is metro accessible. If you haven't ridden the metro before, you'll enjoy it. It is safe, inexpensive, and easy to navigate.